Sooooo pizza. Who doesn’t love pizza? 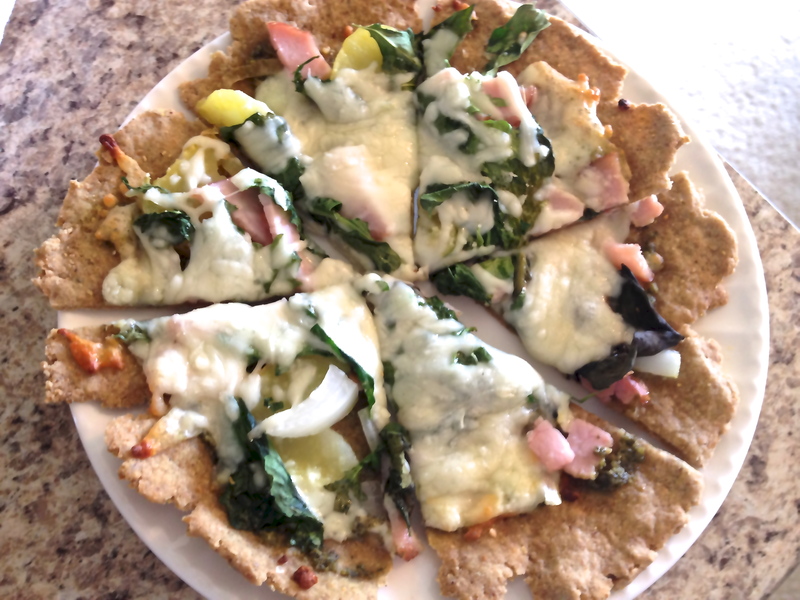 Even better yet who doesn’t love gluten free pizza that is personal sized and might I even dare to say…healthy!? Pizza might be one of my biggest weaknesses. Well, that and ice cream maybe ice cream is my biggest weakness but pizza is right up there with it. Most people think that if you are eating pizza for dinner it’s a pretty unhealthy meal. But I disagree with that, because pizza can be healthy. Now, most of the pizzas you can buy at a say…Pizza Hut or Papa Johns are not going to be healthy. 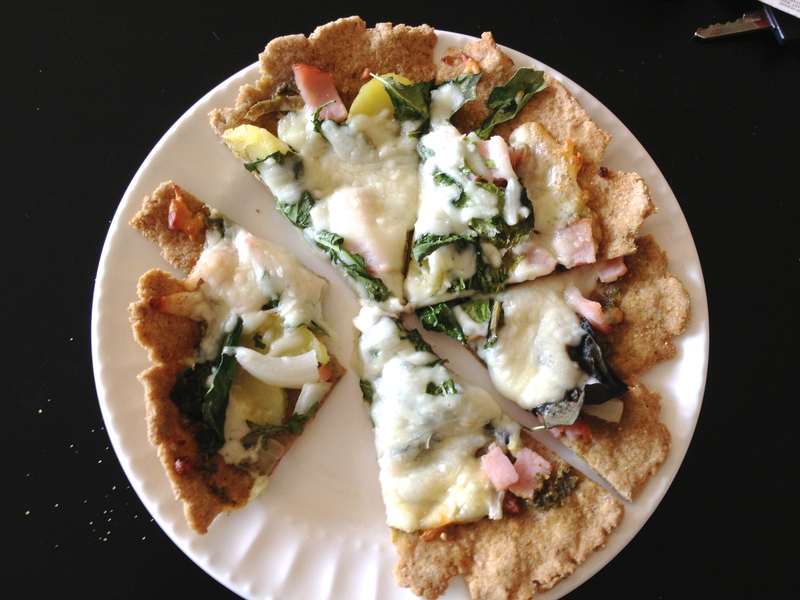 But it is really easy and fun to make your own pizza right at home and its just as delicious if not better. Personally, I am more of a thin crust pizza kind of girl myself. Which, I have found, that most chain pizza places don’t really carry. Most of them say they have a “thin crust” pizza. But they lie. It’s really not. It’s not thin crust if it’s still puffy and squishy with a gigantic crust. They don’t know what they are talking about. 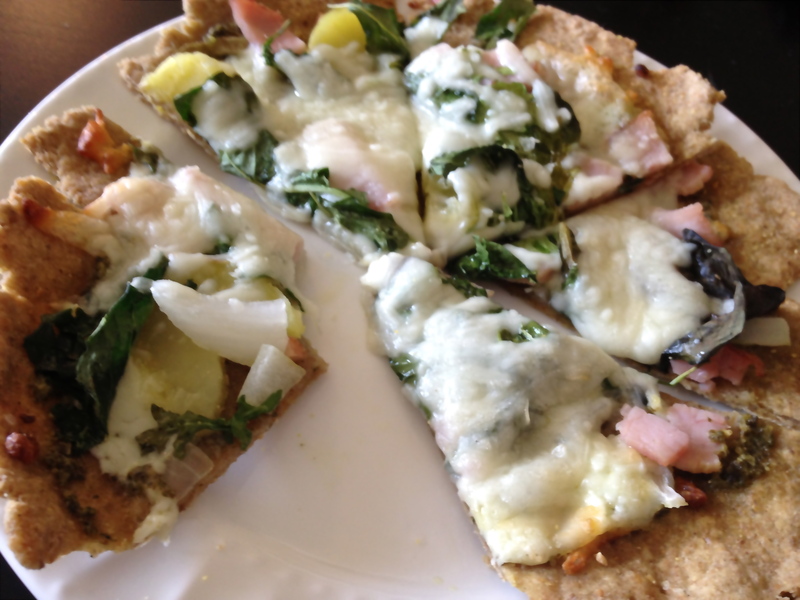 A good thin crust pizza is nice and thin and crispy with very little crust. So, since I cant just go out and buy my thin pizzas I make them, and now that I am gluten free there are very few gluten free pizza places anyway. But anyway, the greatest thing about making pizza at home is you can put any kind of topping you want on them. Its so much fun! I have made a Thai chicken pizza (recipe coming soon), regular pizza, breakfast pizzas, Mediterranean pizzas and this really delicious pesto pizza. MMmmmmm so good. Have you ever put potatoes on a pizza? Because it might be the best thing ever. No joke, you really should try it. It will change your world. 1 very small redskin potato cooked and sliced thinly (you can boil it or microwave it for 2-3 minutes in a wet towel). 1/4 low moisture part skin mozzarella shredded. Mix the gf-flour and flax seed together add water and mix well with hands. Flatten the dough onto the prepared pan. It works best if your hands are a little wet. It will keep the dough from sticking to you. Work the dough out till it is the thickness you would like. Once flatted brush with olive oil and place In the oven for about 10 minutes. Remove from oven, spread pesto on top, add ham, potato slices, gorgonzola, onion and greens then sprinkle with mozzarella cheese. Place back into the over for another 10-15 minutes or until cheese is melted and starting to crisp. Remove from oven, allow to cool for a few minutes then slice and serve! Its delicious! and really easy to make once you have the flour mix made up.